Live medical theater, horror, historical writings, and everything in between. It’s almost midnight, late by any standards. The weary owner passes a filthy rag over the bar-top and stuffs it back in his stained apron. There’s only a few punters left and they’ll be kicked out after a minute or two. He turns to face the back bar, puts on his spectacles and peers at his ledger. The response is unusually deep and resonates around the room. The barman turns and looks up, high, into the face of the largest man he’s ever seen. The giant stoops, almost doubled up, two feet shy of standing upright in the low-ceiling pub. He’s huge, with long, spade like hands, a drawn face surrounding youthful eyes. The barman slowly strokes his mustache. It is in the opinion of this doctor that nothing should stand in the way of scientific discovery, and for those who wish to pursue this ideal, little appears as an impediment. This attitude is well exemplified by the physician and doctor John Hunter (b 1728) who throughout his life worked tirelessly, often 20 hours a day. He exhibited his dedication to the Great Work in such examples as infecting himself with diseases to notate the effects and dissecting bodies before he had even eaten breakfast. When suffering from one of his frequent angina attacks, Hunter was known to rush to the nearest mirror to observe his symptoms (incidentally, that’s how he died – sprinting to a mirror during one such episode). During his lifetime, he made many crucial discoveries and is considered the father of clinical surgery. His dissection skills were renowned and he also studied the physiology of animals, birds and lizards of all varieties. His personal collection numbered in the tens of thousands of preserved specimens. It comes as no surprise then that the immense physical frame of the ‘Irish Giant’ Charles Byrne was of immense interest to him. Standing at almost eight feet tall, Byrne was the talk of London town following emigration from his native Ireland in 1782, at a young 22 years of age . His enormous height was said to have been the result of his conception atop a haystack, and his appeal as the ‘Gentleman Giant’ – dressed in fine clothes and appearing twice a day (barring Sundays) to an enraptured public – would draw crowds from all parts of the city. Having shook hands with the King and Queen, rubbed shoulders (if you’ll excuse the pun) with heads of state as well as other societal elites, his ‘freak’ show appearances had allowed him to accumulate a substantial fortune – over £700 – which sadly went to supporting his escalating alcoholism. His decline was unfortunately swift. His pockets picked of his fortune in 1783 and his fame waning, he sank further into drink as a means to combat the crippling pain experienced from his ever growing body. His physical condition brought severe head-aches, sweats and intense muscular pain. He knew he didn’t have long. And John Hunter knew it too. The immense man had chosen the sturdiest bench and was gulping down his third pint of ale. The remaining customers and the publican watched the gigantic hunched figure as he drank swiftly, occasionally grimacing from some unseen agony. The skeleton today – the brown tinge discoloring the bones was the result of Hunters rushed treatment of the corpse. Wracked by pain, Charles Byrne died on June 1st, 1783, a little over a year after arriving in England. His friends and relatives attempted to carry out his wishes as best they could – but Hunter was more cunning and possessed more resources. Bribing the undertaker for the small fortune of £500, he had the body’s weight in the coffin replaced by slabs of stones and the cooling cadaver was ignominiously whisked away by carriage, the giant corpse propped up on the seats. Hunter did not dally, and although the body did not appear on public display for four years following the body-snatching, he had the corpse sliced up and the bones boiled that very night. 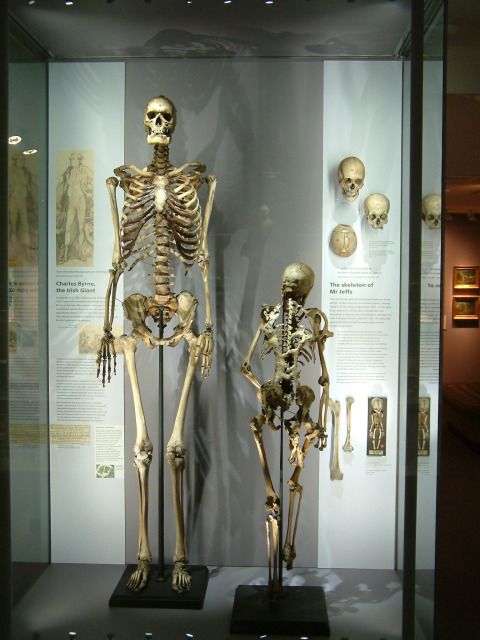 Poor Byrne never escaped the butchers knives and Hunter got his way – as he did with almost everything – and to this day the huge skeleton is on display in the Royal College of Surgeons for all to see. Postscript: John Hunter actually had the skeleton on display a lot earlier than people realized, although in a rather surreptitious manner. In a portrait of him painted by John Jackson in 1813, after an original by Sir Joshua Reynolds, we see depicted a set of skeletal feet hanging behind his left shoulder. This was in fact Byrne, although it was some years before Hunter could show the skeleton in a more publish fashion. Chicago's most canny - and uncanny - medical men graciously invite you to @surgicalmuseumchicago first ever Halloween gala! Join us for an elegantly macabre evening: 🍤Gourmet hors d'oeuvres and desserts 🍷Open bar 🎃Costume contest 💀Scavenger hunt 🔮Tarot readings Ticket link in bio! Friends & enemies! Your favorite medical men are delighted to announce that we shall be guests of honor at @surgicalmuseumchicago Halloween Gala! Please join us for an elegantly macabre evening of cocktails and entertainment. 💀💉 Tickets in bio.